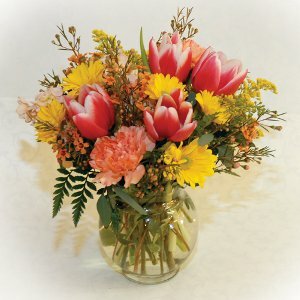 This classic arrangement carries a nice balance of background greens and colorful flowers! The greens are fresh Bells of Ireland, eucalyptus, myrtle, and curly willow. 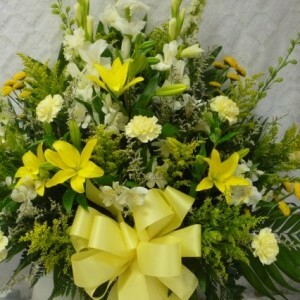 The flowers include roses, Fuji chrysanthemums, and tulips. Presented in a glass vase. 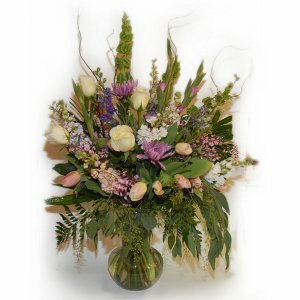 While the arrangement is pictured with a lavender and ivory color theme, other color themes are available for this bouquet: pinks, purples, reds, yellows, or peach/orange. If you’d like a different color theme, please indicate your preferred color in the comments box of your order screen.